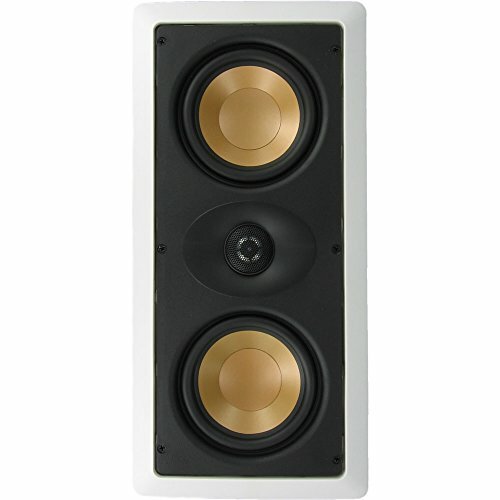 The ProGold series are audiophile-grade built in speakers on a budget. They compare with the best in wall speakers on the market, at a fraction of the price. The ProGold M525.1LCR is an in wall center channel speaker for use with other in wall surround sound speakers to make an in wall home theatre system. It can also be used with other ProGold speakers to create a multi room audio system for whole house audio. This flush mount speaker delivers incredible sound using the "virtual enclosure" of your in-wall space to enhance its bass response and smooth low frequency blending with the midrange. - Lightweight and stiff gold Apolymer-ConesTM deliver excellent damping and bass response. - Pure balanced synthetic silk soft Accutec-DomeTM tweeters create brilliant highs and smooth midranges in an effective diffusion pattern ideal for flat wall installations. - Durable injection-molded butyl rubber surrounds suppress unwanted cone resonances for a lifetime of reliable sound. - Aimable swivel tweeters give greater accuracy and more realistic imaging. Without using any floor or shelf space you can create a virtually invisible in wall speaker system for true multi room audio. Creating your in wall speaker system is easy - built in audio is within reach! Installation requires only that you cut a hole, feed the wires through, and simply drop the speaker in. It is held in place by rotating cams that safely secure it with no extra assembly or mess. Once installed, the paintable grille and flange allows this in-wall center channel speaker to virtually disappear in the room. Resounding, intense, booming bass for that full effect action packed movie from lightweight and stiff gold Apolymer-ConesTM (Propriety coated polymerized woofer material). Brilliant highs and smooth midranges in an effective diffusion pattern ideal for flat wall/ceiling installations come from pure balanced synthetic silk soft Accutec-DomeTM tweeters (Propriety designed density polymer chained formula). If you have any questions about this product by Inwalltech, contact us by completing and submitting the form below. If you are looking for a specif part number, please include it with your message.